Sony KDL-55EX723 review | What Hi-Fi? 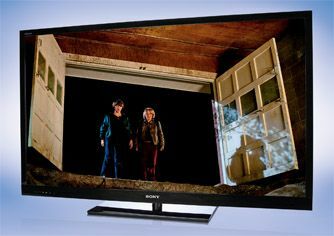 Sony has dropped 52in screens in favour of this bigger size. And unusally in a size sector that tends to favour plasmas, it's an LCD screen. It has an edge-LED backlight (which helps keep its depth down to 4cm), and a dynamic contrast setting that Sony says is ‘mega’. We probably wouldn’t go that far ourselves, but it is true that the EX723 produces deep blacks, and combines these with pure whites. That purity is largely a result of a neutral colour palette that also creates lovely, natural, organic skin tones in the faces of The King’s Speech, yet produces vibrant brightness when you switch to the colourful animation of How to Train Your Dragon. We’ve become accustomed to Sony’s excellent motion handling (although other manufacturers have made major gains), and with both of these Blu-rays the EX723 is is very capable, maintaining solid edges and fine detail during fast-paced action and slow, tricky panning shots. Talking of detail, the Sony reveals as much as its rivals in well-lit scenes, but doesn’t quite have the same level of insight into dark nooks. Unfortunately, 3D Blu-ray performance is disappointing. Play Tangled and the Sony is clearly capable of producing sharp edges and digging up lots of detail, but that also comes with a level of shimmer and crosstalk that makes the experience hard on the eyes. Motionflow and 3D don’t play well together, either, with the film juddering badly. On top of all that, the backlight brightness necessary to mitigate the dulling effect of donning 3D glasses reveals a little clouding across the panel. With DVDs, the Sony is a touch noisy but very detailed, while the opposite is true with standard-def Freeview. Both benefit from the impressively realistic colour palette, though. HD broadcasts are better, with definition and vibrancy to rival others, although the rather cluttered and hard speakers make the audio is weak against most of its rivals. While the EX723’s picture and sound is somewhat inconsistent, its menu system and online functionality are far more convincing. The horizontal icons that represent each menu tab are still there, but they now appear along the bottom of the screen, with the picture shrinking to accommodate it. Each highlighted tab’s options appear up the right-hand side, as do Twitter and Facebook, which are integrated extremely well. Qriocity’s excellent selection of on-demand HD movies completes the excellent package of internet services. There’s no getting around the big problem, though – this is a 3D TV that’s not great with 3D.